It is used in cooking , it is eaten on its own at the end of a meal ,with a glass of red wine, and grated Parmigiano is served with most pasta dishes. I have sometimes heard this superb cheese described as "smelly, sticky and overpowering", but a true Parmigianino has a distinctive rich flavour and is never harsh or over strong. What many people are referring to is the foul smelling "sawdust which is sold in plastic tubs as "parmesan" Unfortunately this product detracts from the reputation of the true Parmigiano, and is an insult to the expertise developed through centuries of artfull Italian cheesemakers. The making of PARMIGIANO REGGIANO the true Parmigianino and other grana cheeses, also loosely known as parmesan is strictly controlled by Italian and European Law. 'GRAN' meaning "of grains" is the name given to all the finest grained hard cheeses originating in the Po Valley in Northern Italy; Parmigiano Reggiano is the finest of these , being matured for up to 3 years but is at is best with at least 24 months maturation. GRANA CHEESE is thought to have been produced as early as 1150ad ;it seems likely that it was made in the first instance because there was an abundance of fresh milk and it was useful to be able to make it into a product which could be preserved for future consumption. GRANA cheese is controlled by a consortium ,established in 1957, which grants seals of quality showing that the cheeses have reached a recognized standard and have been made with milk from the designated areas, known as "zone tipica" PARMIGIANO REGGIANO is produced with milk from the provinces of PARMA, MODENA,and MANTOVA on the right bank of the river Po , and REGGIO EMIGLIA and BOLOGNA on the left bank of the River Ceno. GRANA PADANO is produced in the Po Valley area , more specifically from the provinces of Cremona , Piacenza, Brescia, Bergamo,Pavia, Alexandra, Asti,Cuneo,Novara,Vercielli, Torino, Milano, Como, Sondrio, Trento, Padua, Varese, Venice, Verona, Rovigo,Treviso, Vincenza . A whole Parmigiano cheese is very impressive, in size ,weight and colour,and each cheese is stamped with various markings and seals granted by the consortium, showing that the traditional methods of cheese making have been followed and guranteeing the authenticity of the cheese. More work than you can imagine goes into the production of this colassal cheese. It is a money loser for its producers, making its manufacture a true labor of love. Consider all the work of raising the cows, collecting the milk, producing the curd, forming, storing and aging the cheese, and you begin to get the picture. The cheese is make from partly Skimmed unpasteurized milk. The cows are milked in the evening and then again in the morning. Only certain breeds of cow can produce the protein-rich milk that is used to make Parmigano-Reggiano. The Holstein Friesian breed is the most important of the breeds that are approved for Parmigiano-Reggiano milk production. Each Holstein produces around 2,500 gallons of milk each year. Fed on fresh grass during the summer, during the winter months they are commonly fed dehydrated summer grasses. The dehydration retains the grass' essential nutrients, and maintains a constant flora in the cows' stomachs, leading to less stressed cows who provide a consistent quality milk year round. The evening milk is allowed to stand so that the cream will rise and can be skimmed off. This is used to make Butter. The skimmed milk is then mixed with the unskimmed morning milk in huge copper vats. These have a double inner lining containing tubes through which hot steam can be passed. This gently heats the milk to 28 C. when it is at this temperature rennet is added. and allowed to coagulate for about 15 minutes. A point that might explain the price of this King of cheeses is the fact that it takes 550 kilos of Milk to make a one 35kg cheese !!!!! After 15 minutes the curd is broken up into small grains and is heated up to 45C and is then with the help of a large cheese cloth lifted out of the vat. The cheese cloth is tied to a strong pole and it takes two strom men to lift this Cloth now full of Curd out of the vat allowing the whey behind in the vat. The whey is then used to make Ricotta cheese. The curd is then pressed into a round mold , (each copper vat contains enough milk for one cheese) and it is left for one day. Then it is put into a Brine bath for about twenty days. 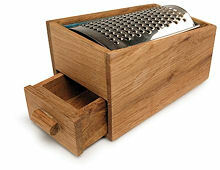 The cheese will loose 20% of its weight between the time that it is first made and the time it is finally ready to eat. After twenty days the cheese is lifted out of its salt bath and is stored for at least a year but no longer than four. During this storage the cheese is turned on a regular basis and cleaned , It is sold on at four different stages of maturity , from young to extra matured , but the one that most people prefer is the Vecchio which is about 24 months old. Unlike other cheeses, there are peculiarities in the production of Parmigiano-Reggiano. For example, at around elevn months of aging, a man called the Battore (the Drummer) taps each wheel of Parmigiano-Reggiano cheese with a small metal mallet. If he hears a hollow sound, the cheese likely has a structural flaw. This unfortunate occurance takes place in roughly seven out of every 100 cheeses tested. These wheels lose their Parmigiano-Reggiano emblem from the rind and are sold to the food processing industry. The Parmigiano-Reggiano wheels that pass the test of the Battore are branded with an identification number, and allowed to continue aging. One month later, each cheese is branded with the logo of the Consorzio. Fresh versions of the cheese can now be legally sold, although most of the product continues to age to at least 18 months. At 24 months, the remianing wheels are once again tested by the Battore, determining those select cheeses that can best survive the longest aging. 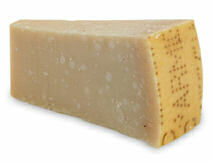 Any Parmigiano-Reggiano that matures beyond two years is labelled stravecchio (extra aged). As time passes, Parmigiano-Reggiano ages and becomes deeper in color, forming white amino acid crystals that pleasantly crunch when you eat them. In addition, its milk sugar (lactose) concentrates and caramelizes, creating an aftertaste of tropical fruit and nuts. This caramelization also makes Parmigiano-Reggiano more palatable for those who are lactose intolerant. Parmigiano-Reggiano production is stewarded by the casaro (cheese maker). His knowledge cannot be acquired in school; it only comes from years of apprenticing. Throughout the manufacture the casaro is constantly checking texture, aroma and quality, mostly with his expert nose and fingers. Health benefits of Parmesan ... Scientists in Italy have extensively studied the health properties of Parmigiano-Reggiano. Their determination: Parmigiano-Reggiano can provide medicinal benefits as it is easy to digest and it works well with the human stomach's natural microflora. In its native region of Italy, Parmigiano-Reggiano is the first solid food given to babies and is used to soothe children with colic. In addition, Parmigiano-Reggiano's high levels of calcium and phosphorus make it an extremely helpful treatment for osteoporosis. Athletes benefit from its extremely high protein value and its comparatively low cholesterol.